EXPERIENCE AN UNFORGETTABLE NIGHT OF STAR WARS & MORE! 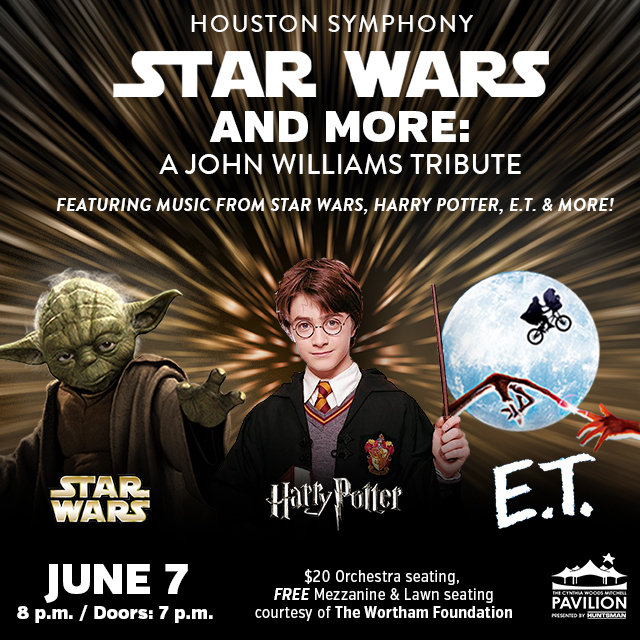 The Cynthia Woods Mitchell Pavilion is proud to host the Houston Symphony for a special evening celebrating film composer John Williams during, “ Star Wars and More: A Tribute to John Williams ” on Tuesday, June 7 at 8:00 p.m. on the Main Stage of The Pavilion. Known for composing some of the most recognizable soundtracks in cinematic history, Williams’ iconic music from the Star Wars and Harry Potter franchises, The Patriot and the Steven Spielberg classic E.T., will be brought to life in a live orchestral performance. Tickets are $20 for orchestra seating. Mezzanine and lawn seating are free courtesy of The Wortham Foundation. Tickets are not required for free seating. During his extremely successful career, Williams has received numerous awards, including five Academy Awards, two Emmys, four Golden Globes and 18 Grammys. He has composed the music to all but two of Spielberg’s feature films. He has conducted orchestras worldwide and most recently composed the score for two blockbusters, Jurassic World and Star Wars: The Force Awakens. His scores for the original Star Wars trilogy transformed the landscape of Hollywood film music and became icons of American culture. Although he will not perform on this program, John Williams previously appeared with the Houston Symphony alongside cellist Yo-Yo Ma in December 2013. Star Wars characters from the 501st Legion will be on hand for photos with attendees during pre-concert activities beginning at 7:00 p.m. in The Pavilion plazas. These international organizations bring together costume enthusiasts from around the world through the creation of some of the most recognizable characters and culture of the Star Wars sagas. The group also serves as a platform for enthusiasts to share their creativity and skills while also giving back to the community through charity work and volunteerism. Other pre-concert activities include The Pavilion Partners arts & crafts booth and Instrument Petting Zoo as well as activities by Mercedes Benz of The Woodlands, Visit South Walton, Woodforest National Bank, Renewel by Andersen and Century 21. Be sure to stop by the Tommy Bahama booth to register to win “The Best Seats in the House” for the next performing arts show with a catered dinner by Tommy Bahama or upgrade your concert view with the Fidelity Investments Seat Exchange, all free to enter. At all performing arts shows, guests are welcome to bring a picnic from home or their favorite restaurant to enjoy in their seat or on the lawn. Keep in mind however, that beverages are not allowed to be brought into The Pavilion. Sitting on the hill? Lawn chairs are also provided free for this event.